Faux Bone is a completely non-toxic, high grade rigid PVC that does not outgas (produce fumes) when heated properly. Because it is malleable at just below 250°F it can be heat formed into just about any shape. It was founded by artist Robert Dancik of Crackerdog Designs. The ability of Faux Bone to take on a variety of finishes, as well as its incredible strength, light weight, extraordinary impact resistance and low cost make it a natural for artists and craftspeople in all disciplines. Faux Bone will accept an endless variety of mark making and surface treatments that can add color. Some of the coloring agents that may be used include: Acrylic paint, oil paint, inks, shoe polish, oil sticks, Pastels, Prismacolor® pencils (other brands don’t work well), Spice pigmented wax (turmeric, henna, paprika work well), and graphite. Other than preventing the material from going above 290 degrees, there are few concerns. Caution should be taken not to burn Faux Bone as the fumes (ONLY IF IT BURNS) are toxic. Faux Bone should not be heated with a flame. Like all artist materials, common sense safety should be followed. Though even the dust from Faux Bone is completely non-toxic, anytime you sand any material it’s a good idea to wear a safety mask. Light cotton gloves are all that is necessary when handling the warmed Faux Bone. While Faux Bone itself is not flammable in a toaster oven, Gilder’s Paste, un-dried sealants and similar materials may be flammable, so caution should be exercised when using these with Faux Bone. 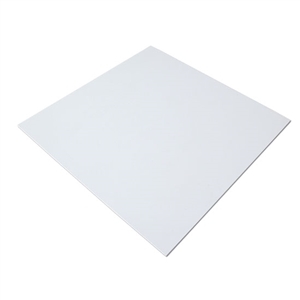 FAU-100 Faux Bone - Sheet - .079" Thick - 8" x 8"
FAU-101 Faux Bone - Sheet - 1/8" Thick - 8" x 8"
Heating Faux Bone in an oven is a fast and safe way to make the material malleable and pliable. Shapes may be cut, finished and heated to 245°F for several minutes (the time depends of the thickness), after which the Faux Bone becomes like thick, cooked lasagna noodles. With gloved hands, the heated material may be shaped freehand, around other objects, pushed into a cutout mold or even die-formed in a hydraulic press or vice. If the result is not what you want, reheat the Faux Bone object and it will return to flat. It can then be reheated, and reformed. This can take place many times with no degradation of the material. As well as heating it in an oven, Faux Bone can be “spot” heated using a hand held heat gun. Heat guns made for use with embossing powders work well. When the Faux bone is hot, it can also be embossed by pressing textured material into the warm material. Pieces of screen, fabric, string, paper etc. can all be pressed into the Faux Bone by squeezing it in a vice, a press, or even just under a heavy weight.